Each year at the annual winter meeting of the Transportation Research Board (TRB), the department honors the most outstanding student from each participating University Transportation Center (UTC) for their achievements and promise for future contributions to the transportation field. 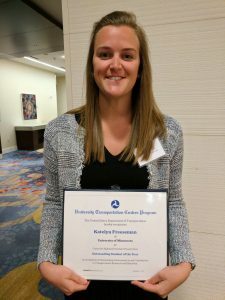 This year, one of those students was Katelyn Freeseman—a recently graduated Ph.D. student in civil engineering from the University of Minnesota. Freeseman was nominated for the award by her advisor Lev Khazanovich for her work in nondestructive evaluation advancements for damage detection in concrete. Today, Freeseman’s engineering career has brought her back to her roots—to Iowa State University, where she received her bachelor’s degree. Freeseman now works with the Institute for Transportation’s Bridge Engineering Center and the National Center for Wood Transportation Structures as a bridge engineer.